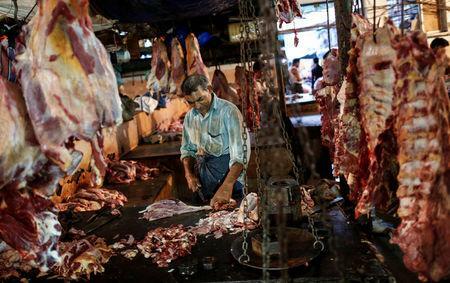 MUMBAI (Reuters) - India's buffalo meat exports are set to plunge 15 percent to their lowest in six years, a leading industry body told Reuters, as world No.1 meat consumer China clamps down on food smuggling. The Chinese government has periodically ramped up customs controls over the last few years as it cracks down on these so-called 'grey trade' networks. "Chinese buying has been very erratic in the last couple of months and that is being reflected in export numbers," said Fauzan Alavi, vice president at the organisation. China's General Administration of Customs did not respond to a fax seeking comment on the issue. Shrinking shipments from the world's No.2 exporter of buffalo meat are likely to drag on prices for the commodity, potentially good news for buyers in countries such as Malaysia, Indonesia, Egypt and Iraq. Exports in the period from last April to November declined 10 percent from the same time in 2017 to 825,570 tonnes, according to data from the nation's Agriculture & Processed Food Products Export Development Authority. In 2017/18 the country's exports stood at 1.35 million tonnes, with Vietnam accounting for more than half the total. India's buffaloes are mainly used for dairy and are only slaughtered for meat after their milk productivity has peaked. That makes the meat produced lower quality than from beef cattle, and is mainly used in processed food, canned goods and low-end dishes. Total Indian buffalo meat exports are around $4 billion a year. "There are times when China puts restriction on cross-border trade and export moderates," said Alavi. "Many Indian states are free from foot-and-mouth disease and exports should be allowed to China from these states," Alavi said. "Chinese consumers are paying unnecessarily high prices. Direct trade would help both buyers and sellers." "But in last few months, demand has moderated from China," he added, declining to be identified due to the sensitivity of the issue. "Other buyers are comparatively small and can't replace China." Exports have also been hit by several temporary meat plant closures in the current financial year that reduced production, said Priya Sud, a partner at Al Noor Exports, which operates abattoirs in Uttar Pradesh. Uttar Pradesh, the country's biggest meat producer, ordered the closure of meat plants during religious festivals as the provincial government, led by a radical Hindu monk, drafted policies to protect cattle.